The Top of the Ocean was once a popular “luxury liner” restaurant in Tacoma, Washington. Located at 2211 Ruston Way in Tacoma, “The Top” was built along Commencement Bay to resemble a docked ocean liner. Architect Charles Kenworthy designed the restaurant and it was constructed by an actual boat company, Tacoma Boat Mart, at a cost of over $260,000. The Top of the Ocean opened on December 15, 1946 and quickly became a hotspot for locals. Over 700 patrons at a time could fit in the restaurant, lounge and three decks. From the beginning, the Tacoma Athletic Commission had used the top deck of The Top of the Ocean as their headquarters. In 1948, the commission purchased the entire restaurant and opened it to the public. The commission would only own the restaurant for three years before selling it to Roger Peck. Over the next 25 years the restaurant would see several owners but very few changes. The Top was something an old Tacoma institution. In 1977, the restaurant would be deliberately set ablaze and a fascionating trial ensued. On the morning of April 3, 1977, an arsonist, using an accelerant, torched the the Top of the Ocean. The fire spread quickly and burned for two hours. Damage to the landmark restaurant was originally estimated at over $500,000 but would actually be more in the $1 million dollar range. Fire investigators immediately determined that the blaze was intentional. The next day, a taxi driver named Richard Black would be the person to finger the assailant. Black told arson investigators that he had driven a man to the Top of the Ocean the previous day and he helped the person load and unload several gallon cans of paint thinner. Almost immediately, 27 year old David Willard Levage was arrested on suspicion of arson. Employees of the restaurant told the police that Levage had been ejected from the restaurant for drunk and disorderly behavior on multiple occasions. In the fact, the night before the fire Levage had been kicked out for harassing customers and staff. He was released from custody after posting $10,000 bail. After a lengthy trial where Levage told the jury that he was having trouble remembering. Levage was found guilty and sentenced to a maximum of 20 years and sent to his new home at the Washington State Correctional Center in Shelton. The story doesn’t end then there. More than one year later, a federal grand jury in Seattle indicted Levage, Pierce County Sheriff, George Janovich, local crime boss John Carbone, and 12 others, for racketeering. It was determined that Levage was one of Carbone’s arsonists for hire. Ultimately everyone but Levage was found guilty of racketeering and other charges. There were plans to rebuild the Top of the Ocean, but the money from the insurance settlement did not cover all the damage done by the fire. The property would be unoccupied for 20 years. Metro Parks Tacoma would eventually acquire the property and build a plank-style walkway over the water, where the restaurant original pilings remained. 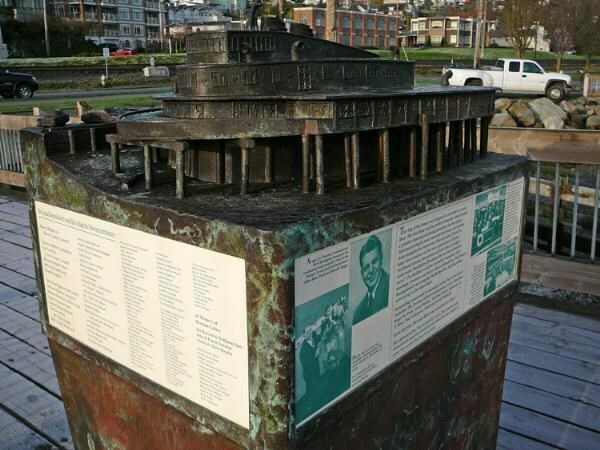 Ten years later, the Tacoma Historical Society, City of Tacoma, Tacoma Athletic Commission and other sponsors, dedicated a small monument to the old Restaurant. The monument is a three-dimensional replica of the “ocean liner” in bronze. It was sculpted by Paul Michaels, and dedicated to the memories of the Top of the Ocean. Is there a way to get a copy of photo of Top of the Ocean with cars in parking lot?